The top story on WND.com right now strikes a triumphant tone as it explains how—after being rejected by the New York Times, among other publications—director Joel Gilbert personally showed up at the New York Post’s offices and convinced the right-leaning paper to run the ad. 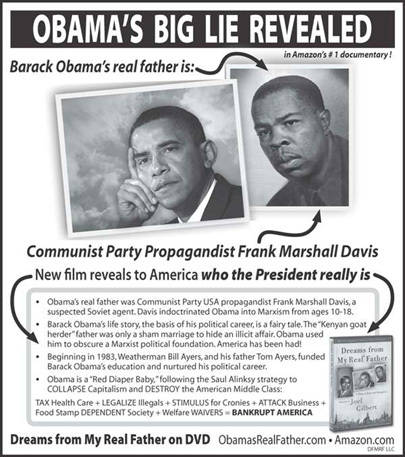 The story is titled “New York Post Ad Exposes Obama’s Real Father.” So apparently ads are news sources now. Then again, this comes from a site that considers Rush Limbaugh’s every pronouncement newsworthy, and gives bylines to Jerome Corsi, an outspoken birther who led the charge in the Swift Boat smearing of John Kerry in 2004. The ad’s one irrefutable claim is that the DVD is topping Amazon’s documentary sales. With few exceptions, reviewers are giving it five stars and gushing reviews. They give less credence to some of Gilbert’s other films, including Elvis Found Alive and Paul McCartney Really Is Dead. Frank Marshall Davis moved to Honolulu in 1948 and became friends with Obama’s maternal grandfather, Stanley Dunham. In his bestselling 1995 memoir, Obama identifies him only as “Frank.” Understandably, the Obama campaign will not dignify the ad with a response.